A beautiful object called an armillary sphere appears mysteriously in the gardens of the sisters’ home on Lake Geneva and plays a key role in The Seven Sisters series. It is believed that the Greek astronomer Hipparchus invented the armillary sphere around 200BC, to decipher how the heavens and stars moved around the earth. His sphere had a ball representing the earth in the centre, and four overlapping rings circling the globe. Over the centuries the design of the armillary sphere has been modified to coincide with new astronomical discoveries. Before the advent of telescopes in Europe in the seventeenth century, the armillary sphere was the primary instrument of all astronomers for determining celestial positions. 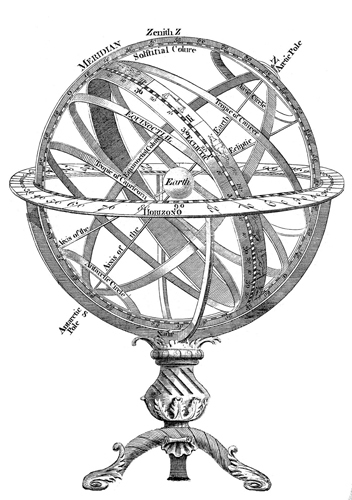 In Renaissance Europe, the armillary sphere was amongst the first complex mechanical devices. Public figures often had their portraits painted showing them with one hand on an armillary sphere which represented the height of wisdom and knowledge. One of the oldest armillary spheres still in existence dates back to Zhang Heng, a Chinese astronomer in 25AD. Using an armillary sphere to map the stars requires considerable skill, but the basic structure is this: one ring is set to represent the horizon, creating a North-South divide on the globe. Another ring, the meridian, is set perpendicular to the horizon. Other rings are set in line with the longitude and latitude lines, and through the centre of these rings, at an angle, is the nomun – a thin metal rod. When you look up the nomun at night, if positioned correctly, it should be pointing directly at the North Star.